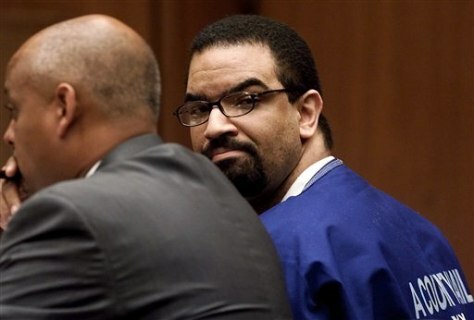 Former Los Angeles police officer Rafael Perez looks back at the courtroom on July 12, 2001. At left is Perez' attorney, Winston Kevin McKesson. Eleven years after Perez was arrested for stealing eight pounds of cocaine from a headquarters evidence room, city leaders believe the Los Angeles Police Department has dashed the image of corruption and abuse created when he confessed.